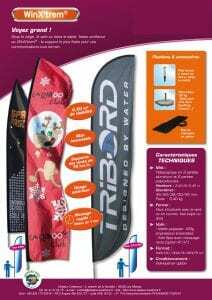 Desjeux Créations will design and make your feather banners & advetising flag: winflag, oriflamme, beach flag, winXtrem, flam... for a hard-hitting communication. Flag shape wing or round. Your company does not have to go unnoticed any more! 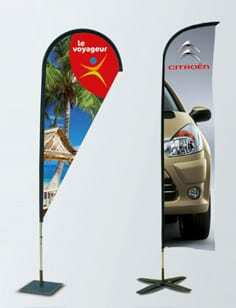 The flag attracts the eye by accentuating the entrance of a stand, a company or a store. Available in shape wing or round to adapt itself to the visual identity of your company, flags can reach 5 meters high for a maximal effect. The structure exists aluminum and also in fiberglass for more lightness. Applications : Signalling system, decoration, PLV, factual for an optimal visibility. Endowed with an original and playful design, the sail stretched out between 2 masts of the flag veils allows a total legibility of the picture. Of a surface more important than other flags and declined under two original forms, this flag is ideal indoor as outdoor. Sound more: the rigidity of its structure allows to protect the life cycle of the painting. Applications : Signalling system, decoration, PLV, event. 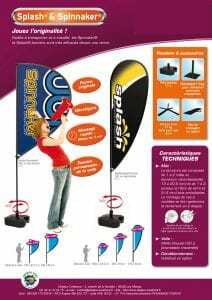 Winflag model spinnaker & splash for event et show. Flag WinXtrem for a visibility outside optimal. We can also value your image during your demonstration thanks to our factual communications tools : stand exposition, comptoir d'hôtesse, kakemono, roller banner, mediacube, mobilier en carton, logo et lettre 3D, toile grand format. Share the post "WINFLAG AND FEATHER BANNERS"